Art Deco enameled coral beaded bracelet, 4 strands: Description by Adin Antique Jewelry. This Art Deco bracelet ascends from customary antique jewellery to the level of applied arts due to its rare combination in craftsmanship of goldsmithed 18K yellow gold, of delicately engraved coral beads and of a black enamelled finish. 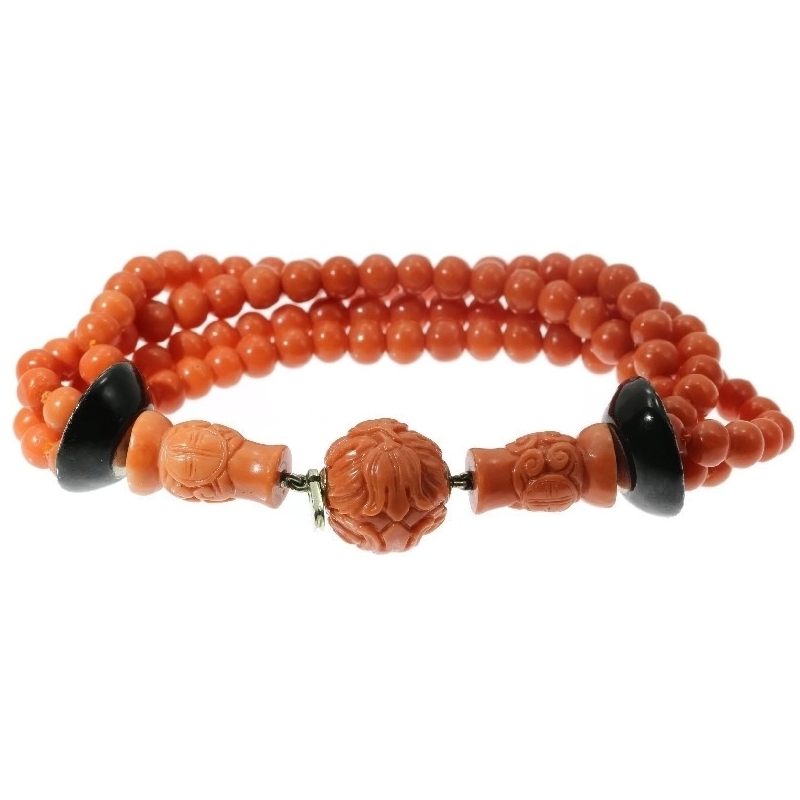 Four coral strands guide you to a Japanese garden with a central round coral bead with tulip engravings, which disguise the jewel's closure. Two engraved columns followed by black enamelled convex portals guard this gem. Being a strong representative of Japonism in the 1920's, this bracelet is eagerly waiting to serve its next Geisha. Style specifics: Abstract motives and geometrical forms are quite typical for the Art Deco period. Extra information: Japonism, or Japonisme, the original French term, which is also used in English, is a term for the influence of the arts of Japan on those of the West. The word was first used by Jules Claretie in his book L'Art Francais en 1872 published in that year. Works arising from the direct transfer of principles of Japanese art on Western, especially by French artists, are called japonesque.